Samsung Diamonds goaler, Caitlin Thwaites will make her return to the ‘den’, signing with the Melbourne Vixens for the 2019 season. With 200 games to her name, Bendigo-born Thwaites grew up playing netball in the Victorian pathway, beginning her professional career at the Melbourne Kestrels in 2002. 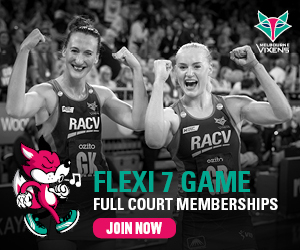 She was a part of the inaugural Melbourne Vixens team for three years, winning the 2009 premiership, before playing for Central Pulse, NSW Swifts and most recently cross-town rivals, Magpies Netball. Thwaites has been named in the Samsung Diamonds squad for the past seven years, notching up 41 Test caps. Thwaites is excited to be a part of the Vixens, a team in which she was one of the foundation players. “It’s a really exciting opportunity to be a part of what the Vixens have created over the last few years,” said Thwaites. “I’ve been able to watch from the outside and see they’re definitely a force to come up against. Head coach Simone McKinnis welcomed Caitlin back to the Vixens family. “We’re thrilled to have Caitlin join us at the Vixens, and I can’t wait to see her join the team,” said McKinnis. “Her experience spanning over 15 years in the domestic competition, and seven years with the Diamonds will be integral to where we want to go as a club in 2019.